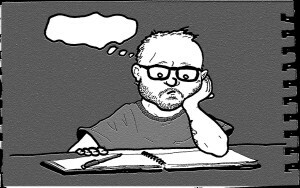 As a writer, I am familiar with this common ailment: Writer’s Block. When it attacks it can make your manuscript seem like the worst in the world. It’s frustrating, miserable, and kinda makes you want to throw your entire manuscript out. Don’t do that. Instead, breathe, and then think about the following. First of all, keep writing. The most important thing is not to stop and take a break. Set a timer for yourself and keep writing. I don’t care if you write four paragraphs of “la, la, la, la, la…” or “weeeeeeee,” you need to keep putting letters on the page, because if you stop writing you may never return. Second, my moments of inspiration often happen when I’m neck-deep in other, necessary, work. For example, my most creative inspirations often come while I’m in my calculus II class. I’m so disinterested in what I’m supposed to be doing that my mind finds an alternative, which usually comes in the form of storylines. I am also inspired when I have three tests and two papers that I should be working on. And, for me, I let it flow. Mostly because I’m passing calculus with no problem, so taking some time in my mind to fix my entire plot problem is not an unworthy cause. Listen to your body, your mind, and the little beast inside you trying to sort through millions of plot lines and make it into a seamless story. Someone once said that what you do when you procrastinate might be what you should do for the rest of your life. Now me: When I’m listening to music I’m thinking about what scene in my book it would go with. When I’m rushing to class I picture myself as my main character running to/from whatever she’s running to/from. I do my homework and I think about if my character’s love interest would need to know it. I read other books and I look for inspiration for plot lines and characters. When I walk around at night I put myself into the scene where my character is sneaking around to spy on someone. It’s my procrastination. It’s my second world. My split personality. Is it yours? If not, that’s okay. It doesn’t have to be. But it certainly helps. I don’t know why you are writing a book, story, poem, song, or anything else, but trust that your reasons for starting are good enough to finish. This entry was posted in Claire Staley, Keys to Success, writing and storytelling and tagged challenges, claire staley, keys to success, writer's block, writing on June 22, 2015 by SR Staley. There are specific rules that are almost always followed in fiction, such as no adverbs, show don’t tell, and don’t overwhelm your readers with too many characters at once. 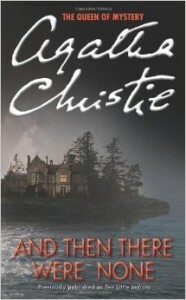 Agatha Christie broke all of these rules in And Then There Were None, a mystery novel involving ten strangers with shady pasts on a deserted island. And yet, she is praised as one of the greatest mystery novelists. After reading this novel, she had me question my own past. Was I a murderer, too? The reader is immediately introduced to all ten characters at once, and the reader gets multiple points of view. It’s chaotic, but I kept reading. She uses adverbs all the time, and yet it seems appropriate for the story type. They did not jump out at me as usual. She tells the reader what is happening and how the characters are feeling instead of showing them, but it works because the reader is never supposed to understand the characters to their fullest extent. There is a time to break all the rules. There is a time to do what feels right instead follow conventional norms. There are times it makes sense to forgo the common, but the decision should be made intentionally. The author should know why he or she chooses to break the rules, and he or she should understand why the rules are put in place. That being said: listen to your gut and remember that writers are artists, and artists are supposed to do whatever they want with their art. Go forth and be free, and write something amazing. This entry was posted in Claire Staley, writing and storytelling and tagged agatha christie, claire staley, then there were none, writing rules on June 19, 2015 by SR Staley. Perhaps it comes from insecurities almost everyone has about their futures. When someone works so hard at school and they still face an uncertain future, maybe it feels unfair that someone who didn’t “work as hard” could be completely fine. Others are jealous and wish they had a lifestyle like that. I know I do. I could easily see myself working at a dive shop in the Caribbean for minimum wage. But this stigma our culture has about education makes me stay in college. (Ok, maybe I really like learning through books and classes as well). Does every person have a deep-seated need for adventure? Surely the ski-bums are living an adventurous life on the border, rebelling against society norms. Sitting in chemistry class three days a week doesn’t always get the blood rushing. The SCUBA diver in Costa Rica is probably marching through a jungle and discovering great things. Having an adventure. Some talk about those people and say this: “It’s fine, I mean do whatever you want, but what are you DOING with your life?” And then they huff, pout, and sigh about people who have no drive or sense of future. That’s a lot of energy to put into someone else’s life, especially someone you might not even know. In truth, at least to me, these people are neither here to be admired nor disliked. They do not want nor need the approval or opinion of those they do not know. They simply are living the best way they know how, and perhaps they have the right idea when it comes to life paths. Who knows? Instead of worrying so much about the future, perhaps we shouldn’t worry about anything at all for a bit. And if that means chilling out for a bit in Africa, it’s really none of my business. “You do you, and don’t forget to go slow,” as they say on Caye Caulker, Belize. This entry was posted in Claire Staley and tagged adventure, Belize, Caye Caulker, claire staley, college life, scuba, skiing, social norms on April 17, 2015 by SR Staley. When one turns 21, as I did recently, one is expected to indulge in the “adult” practices of alcohol, practicality, and business meetings. After all, I am no longer a teenager (which brought on a brief existential crisis at 20), and I am far beyond the time when I believed fairies existed under each flower petal and mermaids swam in the oceans (although I’m still not prepared to give up the latter). I am a fully functioning college student beginning to understand financial aid, cooking, and her own bedtime…sort of. The fact is, Santa Claus isn’t real, my pet dragon is actually imaginary, and true love’s kiss won’t break any spell. What confuses me most is that I barely noticed these changes as birthdays passed. I can’t pinpoint the moment when my dolls became plastic instead of people, when I stopped looking for faerie circles in the woods, and when creating my own elven language lost it’s thrill. They just faded away, and I miss the sense of adventure they brought to my life. I miss the way it made anything exciting and created a world that only I could see. Something I could understand. And now I have term papers and tests and loud dorm mates that make me question my belief in not killing people. My willpower against the latter prevails. However, as I was rereading Harry Potter for the umpteenth time, I realized something. Perhaps my way to find magic had just changed. There was certainly magic in these books, because the magic was happening inside my head and I was living it. And that is real. It is a tangible thing to be captivated by a book, to be so entrenched in the story and the characters that you cry and laugh and mourn them, to feel the real and powerful sadness that comes with a certain character dying, to love Isabella in The Pirate of Panther Bay like a sister, and to feel as in love with Augustus Waters as Hazel Grace is (in The Fault in Our Stars). Perhaps, as an adult, magic has just changed. And who knows, really, if there are fairies underneath flower petals. They wouldn’t let us see them anyway, so does it matter? Perhaps I should just remember that not everything in the world needs or wants an answer. And perhaps I am quite happy with filling that space with this particular kind of magic. It’s way more fun for the world to have magic in it anyway. So who cares if there is or there isn’t any. I’m happy just believing that I can be flown on a dragon to a pirate ship in another world. This entry was posted in Books, Teen & YA fiction, writing and storytelling and tagged adulthood, adults, benefits of reading, books, claire staley, fairytales, fantasy vs real world, fault in our stars, harry potter, Isabella, john green, magic, pirate of panther bay, reading on December 25, 2014 by SR Staley.